At first glance, Walmart (NYSE:WMT) is an anomaly. While most stocks have struggled to mitigate their sharp losses, WMT stock has performed surprisingly well. The ubiquitous big-box retailer ended the month of October up 6.4%. In the second half of this year, Walmart stock has gained nearly 18%. Let’s contrast that with the retail sector’s benchmark exchange-traded fund, SPDR S&P Retail ETF (NYSEARCA:XRT). WMT stock is one of the XRT’s top holdings. However, this retail-centric ETF dropped 8% in October. In the second half of 2018, it’s down 2%. Of course, the against-the-grain trend of Walmart stock is exactly what you wouldn’t expect. The ongoing trade conflict with China has worsened recently, with President Trump’s administration threatening to impose new tariffs on the Asian nation. Next month, Trump and his Chinese counterpart, President Xi Jinping, are slated to discuss economic matters. For what it’s worth, Trump has recently expressed optimism about a potential deal with China. However, if the talks fail to produce a meaningful result, the White House has announced its preparedness to impose $257 billion of new tariffs on China. According to CNBC, the U.S. has already imposed $250 billion of tariffs on Chinese goods. Obviously, this is a bad situation for WMT stock. China has responded with $110 billion of retaliatory duties on American exports to the Asian powerhouse. If the talks falter, the Chinese government will have no choice but to respond again, because Beijing does not want to be perceived as weak. Such guaranteed “mutually-assured destruction” has hurt WMT rival Target (NYSE:TGT). TGT shares have dropped more than 5% since the beginning of September. That said, no company can escape broader fundamental pressure forever. In the final session of October, Walmart stock took a tumble, dropping 2%. Is the China trade war finally catching up to WMT stock? Or can investors still rely on the retail giant? Admittedly, the recent decline of Walmart stock will cause concern because of the proximity to the. company’s third-quarter earnings report, which is due out before the opening bell on Nov. 15. Generally speaking, Walmart consistently meets or exceeds consensus estimates. However, the upcoming Q3 results will be very important. Not only will Wall Street look for strong numbers to justify the momentum of WMT stock, but analysts will carefully analyze the company’s guidance. Any hint that management lacks confidence about the future, especially with the holidays coming up, will hurt Walmart stock. Moreover, the geopolitical situation is likely to negatively impact WMT stock. In September, former Walmart CEO Bill Simon predicted that the retailer would soon raise prices on its goods due to the U.S. tariffs. That’s a huge no-no for WMT stock, as the company relies on everyday low pricing. However, longer-term investors should avoid panicking. For one thing, management continues to innovate and search for new opportunities. Recently, WMT has addressed a serious inconvenience for holiday shoppers: long – and sometimes violent – checkout lines. For the first time, Walmart employees will carry mobile devices that will allow them to process payments. That will enable customers who are only shopping for a few items to bypass long, aggravating lines. This is a classic case of a company discovering a problem and delivering a solution. It’s smart and should bolster WMT . Another area that management is eyeballing is the company’s parking lots. They’re huge, and multiple spaces go unused. Walmart hopes to redevelop these spaces into restaurants, parks and entertainment venues. Again, that’s smart thinking. While I believe that Walmart will work its way out of its recent funk, I must respect the broader environment. The brewing trade war with China looks ugly. Conservative investors may want to watch the news carefully while steadily buying Walmart stock. Ultimately, I’m bullish on WMT stock. Sure, the company sells mostly Chinese goods, but what isn’t made in China these days? That shouldn’t be the overriding story here; instead, the main story is that Walmart performs a necessary function for consumers. If the trade war escalates, it escalates. People will find ways to buy groceries, clothes, toiletries and other essentials. 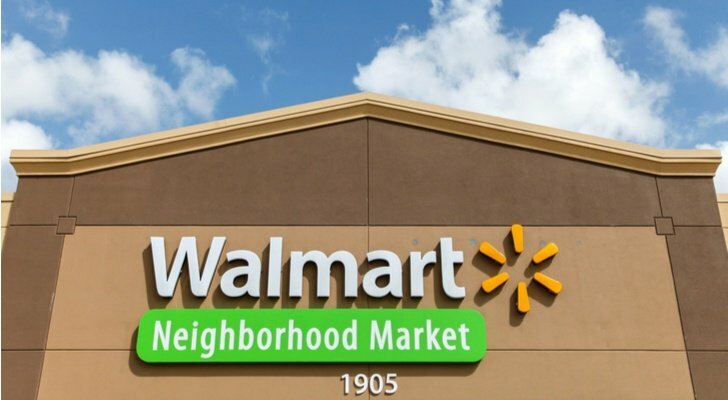 Plus, Walmart is aggressively competing with Amazon (NASDAQ:AMZN) as the big-box retailer moves further into the healthcare sector. Finally, we have no guarantee that the trade war will continue for years. Although we’re hurting, you can bet that we’re hurting China more. Two pieces of evidence confirm this. One, its citizens are openly criticizing its government, which is a true rarity. Two, China’s retaliatory responses haven’t matched our tariffs 100%. In other words, Beijing isn’t crazy. Again, the situation doesn’t look great from here. However, it’s not entirely fair to assume a dire scenario for WMT. Article printed from InvestorPlace Media, https://investorplace.com/2018/11/despite-downturn-wmt-stock-is-still-attractive/.